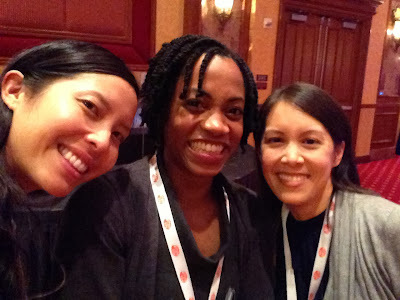 Last weekend Sarah and I attended the first ever Food Allergy Bloggers Conference, an event that drew scores of food allergy parents, parent-bloggers, and parents-turned-bloggers-turned-enterpreneurs together in Las Vegas. to ready ourselves for an event-filled FABlogCon. Over the course of two days, prominent allergists, physicians, and researchers expanded our knowledge on anaphylaxis and its incidence rates, the importance of epinephrine, current clinical research on possible treatments, and the varying impact of food allergies across different age groups. There were also practical sessions with authors, tech gurus, and successful proponents of food allergy legislation who offered advice on how to take the next steps in our advocacy work, personal blogs, and related pursuits to craft and market our hard work into something more accessible and possibly profitable. effects on the ways adolescents and young adults manage them. Sobering and alarming research on risk-taking! The conference was as rich with information as it was with passionate and creative attendees. There were parents, grandparents, siblings, and individuals living with food allergies themselves. If you have checked out a food allergy blog or bought a product or cookbook that catered towards your restricted diet, chances are the individual behind that precious resource was there at the conference! I couldn't help feeling a little intimidated upon first meeting Lynda Mitchell, founder of Kids with Food Allergies; Eric Edwards, co-inventor of Auvi-Q epinephrine auto-injector; and Heather Mehra, co-creator of the No Biggie Bunch children's books. Of course, after we started chatting my nerves eased up. They, as well as all the attendees I met, are just regular people whose work is motivated by wanting to support all who are also living with food allergies. about Sarah's son's experience with self-administering Auvi-Q. Our newest food allergy friend, Devin, is the author of Nom Yum Free. Check out her blog's gorgeous photos of her vegan, nut-free, raw recipes. with free allergy alert wristbands and labels and an insulated medicine bag. my Sun Cups and Skeeter Snacks because they simply would not fit into the photo. 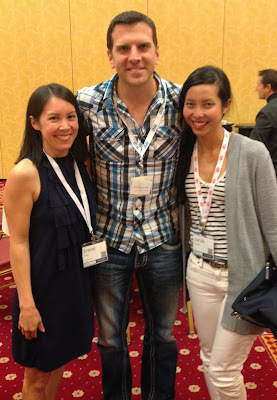 So many bloggers and food allergy advocates, and so little time! I wish I could have met Drs. Michael Pistiner and John Lee, allergists and co-founders of AllergyHome. AllergyHome is one of my favorite resources for educating caregivers, school communities, and others whose awareness is critical in keeping our food-allergic kids safe. Its Facebook page sends out clever food allergy PSAs, too. Maybe next year! Special thanks to master organizers, Jenny Dare Mitchell Sprague of Multiple Food Allergy Help and HMO Woodrum of Oh Mah Deehness, and the many volunteers who made this conference happen. The meals were delicious and allergy-friendly (thanks to the allergy-aware Chef Keith Norman), accommodations were great, the variety and scale of sponsor freebies were mind-blowing (our suitcases overfloweth! ), and everything ran smoothly. It's been a growing struggle for Sarah and I to juggle our personal/family/work needs and commitments with blogging. As our kids are getting older, we have gotten busier and busier and something has had to give -- and it won't be the care of our kids. Sarah and I left the conference feeling reassured and inspired by all the spirited blogging and food allergy advocacy work going on in communities all across the country. No matter how small or how often we blog, we are all helping food allergy families everyday by adding our voices and sharing together in this journey. We are already looking forward to the next Food Allergy Bloggers Conference! I like your reasoning for why the chocolate had to be eaten! :) So glad to have met you and appreciative that you were a part of the first conference. That is awesome. Very interesting post, thanks for sharing! It is cool to see conferences focused on educating people about allergies and their treatments. I learned about allergy testing and its benefits when my brother was tested for allergy many years ago. He found out that he was allergic to quite a few things, including animal dandruff and shellfish. Soon after being tested, my brother got allergy shots every week, and after a year or so he could be around animals and eat shellfish! This blog will give the detailed information about the Allergist and about allergy diseases. This is really a knowledgeable blog; we were impressed with the quality of your work.